This chapter describes the server, storage and networking infrastructure that needs to be defined for providing Infrastructure as a Service (IaaS) cloud using the Oracle VM technology. This section helps you get started with this chapter by providing an overview of the steps involved in setting up the virtualization infrastructure. Consider this section to be a documentation map to understand the sequence of actions you must perform to successfully set up virtualized systems. Click here to view a visual demonstration on how to discover OVM servers into the Cloud, configure storage for the Cloud, configure networking, and create server pools and Cloud zones using Oracle Enterprise Manager Cloud Control 12c. Before you start monitoring and managing virtualization targets, you must register the Oracle VM Manager with Oracle Enterprise Manager. See Registering the Oracle VM Manager for details. You can then discover one or more Oracle VM Server targets. See Discovering a Virtual Server for details. Set up the storage infrastructure for the cloud. See Registering Storage Servers for details. Configure networks and VLAN Groups. See Setting Up Networks for details. Create a virtual server pool. See Creating a Virtual Server Pool for details. Create a zone by grouping one or more server pools. See Creating a Zone for details. Figure 4-1 shows the sequence of steps involved in setting up the virtualization infrastructure. Right click on a target in the left panel. Select a target on the Members region on the parent target home page and then select the Action menu. Select the Target menu of the corresponding Target Home page. The Oracle VM Manager provides the user interface that allows you to create and manage zones, virtual server pools, virtual servers, and guest virtual machines. Before you use the Oracle VM Manager to manage virtualization targets in Enterprise Manager, you must register an existing installation of the Oracle VM Manager. The Oracle VM Manager that you register with Enterprise Manager must be at least version 3.0.2 or higher. The Oracle VM Manager must be associated with only one Enterprise Manager installation. As a best practice, it is recommended that the Management Agent and the Oracle VM Manager are present on the same physical machine. If you are registering Oracle VM Manager 3.3 or later, you must ensure that the Enterprise Manager for Oracle Virtualization (Oracle Virtualization) plugin 13.1.1.0 or a later version has been deployed on the Oracle Management Service and the Management Agent. If you are registering Oracle VM Manager 3.1.1 through 3.3, before you update the Oracle VM Manager URL, you must have configured tcps as described in Configure Secure TCP (TCPS) for Oracle VM Manager (Doc ID 1456338.1). If the certificate is being imported for multiple Oracle VM Managers, you can specify multiple alias names. If you are registering Oracle VM Manager 3.3, in addition to importing the Oracle VM Manager certificate, you must export the Oracle VM Manager WebLogic certificate and import the certificate to the Agent Keystore. See Importing the Oracle VM Manager WebLogic Certificate for details. From the Enterprise menu, select Cloud, then select Oracle VM Infrastructure Home. From the Infrastructure Cloud menu, select Register OVM Manager. The Add Oracle VM Manager page appears. Enter the target name for the Oracle VM Manager instance to be registered. Select the Management Agent to monitor and manage the Oracle VM Manager instance to be registered. It is recommended that the Management Agent (with Enterprise Manager for Oracle Virtualization plug-in (listed as Oracle Virtualization in Self Update) is present on the same machine where the Oracle VM Manager instance is running. If you are registering Oracle VM Manager 3.3, this URL is used to connect to the Oracle VM Manager. By default, data from Oracle VM Manager is automatically synchronized with Enterprise Manager at fixed intervals of time. If you do not wish to enable this option, you must disable the Automatic Synchronization checkbox and manually synchronize the data. For more details on the automatic and manual synchronization options, see Synchronizing the Oracle VM Manager Targets for details. Enter the administrator user name and password to connect to the Oracle VM Manager URL provided in Step C. If you want to use separate credentials for managing Oracle VM Manager, check the Use Administration Credentials check box. If these credentials are not specified, the monitoring credentials are used by default. Click Submit to register the Oracle VM Manager. You can now use the Oracle VM Manager to monitor and manage the virtualization targets in Enterprise Manager. You must export the Oracle VM Manager WebLogic certificate and import the certificate to the Agent Keystore. See Importing the Oracle VM Manager WebLogic Certificate for details. Enter the Oracle VM Manager URL. If you had Oracle VM Manager 3.0.x registered with Enterprise Manager previously and had upgraded it to higher versions 3.1.x or 3.2.1, you must update the Oracle VM Manager URL. If you are upgrading to version 3.3, you must also import the WebLogic certificate. See Importing the Oracle VM Manager WebLogic Certificate for details. Before you update the Oracle VM Manager URL, you must have configured tcps as described in Note 1490283.1. Right click on the OVM Manager target that is to be upgraded and select Edit. Enter a tcps based (tcps://hostname:port) URL in the Oracle VM Manager field. For Oracle VM Manager versions 3.4 and above, tcps is not used. But a dummy value such as tcps:// must be entered for the registration to be successful. Oracle VM Manager version 3.3 or later contains an internal Certificate Authority (CA) that is used to perform certificate-based authentication and to sign the SSL certificate that is used for the web-based user interface. Certificates are generated automatically when Oracle VM Manager is installed. If you are using a pre-3.4 Oracle VM Manager version, you must delete the first line in the <file_loc_for_certificate>: "libdir is /u01/app/oracle/ovm-manager-3/ovm_upgrade/bin/./../lib"before you can import the OVM Manager certificate. Automatic discovery is a process that detects hosts, Oracle VM Managers, and other targets so that they can be monitored and managed by Enterprise Manager. If you know the Oracle VM Manager instances in your environment, see Registering the Oracle VM Manager for details on registering them with Enterprise Manager. Discovery and promotion of Oracle VM Manager should be attempted if you want to scan your networks to discover unknown Oracle VM Manager instances. Log in to Enterprise Manager as a user with the Super Administrator role. From the Setup menu, select Add Target, then select Configure Auto Discovery. In the Network Scan-based Auto Discovery table, click Configure Network Scan Discovery in the Host and Oracle VM Manager row. The Network Discovery page appears. Use this page to search, browse, and create OVM Manager discovery specifications. Click Create. The Network Scan Discovery: Create page appears. Enter the Name and Description for the Discovery Specification. Click Add in the Network Scans region to select the Agent that is to be used perform the IP scan. For each Agent, specify the IP ranges for the scan. The following formats are supported: host name, IP address, and IP range. Use space to separate values. Use the Job Details tab on the Host Discovery Specification Create page to schedule the discovery IP scan, allowing you to start it immediately or at a later specified time. Use the Credentials section to enter preferred credentials for the host. You can choose from Preferred Credentials, Named Credentials, or New Credentials. The discovery IP Scan is run as root. It is required that you set privileged host credentials or named credentials that use Sudo. You can use the Host Discovery page to check the status of discovery and view newly discovered OVM Managers. After the target has been discovered, from the Setup menu, select Add Target, then select Auto Discovery Results. Enterprise Manager displays the Auto Discovery Results page where you can review discovered unmanaged targets and promote targets to be managed by Enterprise Manager for monitoring. On the Network-scanned Targets tab, the target discovery results are displayed in the table at the bottom. Select the OVM Manager target and click Promote. The OVM Manager Registration page is displayed. See Registering the Oracle VM Manager for details. Upgrade Oracle Management Service to 12.1.0.4 and deploy the Oracle Virtualization plugin version 12.1.0.7 or higher. Upgrade Management Agent to 12.1.0.4 and the deploy the Oracle Virtualization plugin 12.1.0.7 or higher. Blackout the old Oracle VM Manager target. Upgrade the Oracle VM Manager to 3.3.1. For more information, see the Oracle VM Installation and Upgrade Guide for Release 3.3. Upgrade the Oracle VM Server to 3.3.1. For more information, see the Oracle VM Installation and Upgrade Guide for Release 3.3. Import the WebLogic certificate. See Importing the Oracle VM Manager WebLogic Certificate for details. Change the blackout status of the Oracle VM Manager target. Add or modify the target property if required. For example, Webservice URL using Edit Oracle VM Manager page. Upgrade Management Agent to 13.2.1.0 and the deploy the Oracle Virtualization 13.2.1.0 plugin..
Upgrade the Oracle VM Manager to version 3.4. For more information, see the Oracle VM Installation and Upgrade Guide for Release 3.4. Upgrade the Oracle VM Server from 3.3.x to 3.4. For more information, see the Oracle VM Installation and Upgrade Guide for Release 3.4. Note: If you are upgrading the Oracle VM Server from the 3.2.10 version, follow the steps listed in the Oracle VM Installation and Upgrade Guide for Release 3.4. Import the WebLogic certificate. SeeImporting the Oracle VM Manager WebLogic Certificate for details. From the Enterprise menu, select Cloud, then select Infrastructure Home. Click on an OVM Manager target in the left panel. From the VM Manager menu, select Target Setup, then select Monitoring Configuration. The Monitoring Configuration page for the OVM Manager target appears. LiveSyncEnabled: Indicates if auto synchronization is enabled between Enterprise Manager and Oracle VM Manager. By default, this is true. If enabled, the data is synchronized every 1 minute. Timeout Settings For Network Configuration of Deployment: The total wait time allowed for network configuration during assembly deployment. The default is 60 minutes. OVM Job Retry Count: The number of attempts that can be made after which the OVM Job should be retired. The default number of attempts is 5. OVM Job Retry Sleep Interval: The interval between two subsequent OVM job retry attempts. The default interval is 5 seconds. Timeout value for short running OVM Job (minutes): The time interval allowed for an OVM job to be completed. OVM Manager Console URL: The URL used to launch VNC consoles for VM. For Oracle VM Manager 3.3, this URL is used to connect to the Oracle VM Manager. OVM Manager URL: The OVM Manager registration URL used for communication between Enterprise Manager and Oracle VM Manager. Oracle VM Manager Password: The password required to access Oracle VM Manager. Oracle VM UUID: The internal Oracle VM identifier. Timeout Settings for Product Configuration of Deployment: The total wait time allowed for product configuration during assembly deployment. The default is 60 minutes. Timeout Value for Checking if SSH Service is Running on a Deployed Virtual Machine: The total wait time allowed to check if the SSH service is running on a Guest VM. This parameter is used as prerequisite for deploying the Management Agent on the Guest VM. SyncDataFetchTime: The time at which the Oracle VM Manager was last synchronized. SyncStatus: The status of the Oracle VM Manager synchronization. Deployed on Exalogic: Indicates whether the Oracle VM Manager is inside an Exalogic rack. After editing the entries, click OK to return to the previous page. Select an Oracle VM Manager target from the right panel to navigate to the Oracle VM Manager Home page. From the Target menu, select Monitoring, then select Metrics and Collection Settings. Click Other Collected Items and then click the Collection Schedule link for the OVM Manager Events Data metric. Modify the frequency as required, click Continue, then click OK.
Navigate to the OVM Manager homepage. From the Target menu, select Target Setup, then select Edit OVM Manager. Select the Automatic Synchronization check box and click Submit. Right click on an OVM Manager target from the left panel and select Synchronize. A confirmation message appears. Click Submit to submit a job to perform synchronization. The targets in Enterprise Manager and OVM Manager are synchronized. Targets that are not present in OVM Manager will be removed. For targets present only in OVM Manager, corresponding targets are created in Enterprise Manager. Configuration collections are refreshed for all other targets. A virtual server is a generic term used to describe a physical box which has virtualization software (hypervisor) running on it. A new virtual server can be provisioned by installing the OVM Hypervisor on a bare metal box. Before you add a virtual server to a server pool, it must be discovered. Click on an OVM Manager target from the left panel to navigate to the OVM Manager Home page. From the VM Manager menu, select Discover Virtual Server. Specify the host name or the IP address of the virtual server. You can enter multiple host names or IP addresses on separate lines. Enter the user name and password of the Oracle VM Agent running on the virtual server to be discovered. Click Submit to discover the virtual server. The newly discovered Oracle VM Server contains some basic information about itself, and about any immediate connectivity to a network storage, but it is considered to be in an unconfigured state. After the storage and networking has been configured, the Oracle VM virtual servers are ready to be used as the infrastructure for cloud. Right click on a Virtual Server target in the left panel and select Rediscover Virtual Server. A confirmation message appears. Click OK to rediscover the virtual server and discover any new NICs and LUNs that have been added. In Oracle VM Manager 3.3, VLAN Groups have been replaced with VLAN Interfaces. When you are configuring the VLAN Interface, you are prompted for the VLAN Segment IDs and the ports on which the interfaces are to be created. Virtual network interfaces (VNICs) are used to carry network traffic to virtual machines. You can generate MAC addresses that can be assigned to VNICs in a virtual machine. Specify a range of MAC addresses that need to be generated. VLAN Group has been replaced with VLAN Interface and during Vlan interface configuration, it asjs VLAN Segment ID's and then Select Ports of Servers where the Interfaces to be created"
MAC addresses must be unique across all Oracle VM Managers in the data center. Right click on an OVM Manager target from the left panel and select Manage Network. Click the Virtual Network Interface Card Manager tab. Click Generate. In the Generate MAC Addresses pop-up window, you are prompted to specify an initial MAC address in 3 sets of 3 characters. This is a two-digit number for the Initial MAC Address. Click OK to return to the previous page. You can now use these VNICs while creating virtual machines. If you are using 3.4 or later versions of Oracle VM Manager, enter the From and To range in the Dynamic MAC Address field and click Apply Range. This range will then be used to create MAC addresses as needed in future deployments. Configuring a VLAN Group is an optional feature. If VLANs exist in your physical network, you must follow the steps in this section to use them in the cloud. VLAN (Virtual Area Network) is a mechanism to virtualize network interfaces across subnets and physical location so that they appear to be on a single confined LAN. This concept is used to isolate (and group) the network traffic across these distributed interface, which enables secure network traffic within such nodes. You can create multiple virtual LAN (VLANs) on the same NIC port. Each VLAN is an independent logical network operating with other VLANs over the same physical connection. Configuring VLANs involves creating one or more VLAN Groups, each of which contain multiple VLANs segments. Click the VLAN Groups tab and click Create. Enter a name and description for the VLAN Group. Enter one or more VLAN Segments. This is the VLAN ID that is enabled on the switch ports connecting the virtual server to the switch. The valid range is from 1 to 4094. Click Add to select the ports to be added to the network. Select one or more virtual servers to be added to the network. If you add more than two ports of a virtual server, the first four ports will be bonded. Network bonding refers to the combination of network interfaces on one host for redundancy or increased throughput. If your network supports jumbo frames, you must set the Maximum Transfer Unit size in the MTU field. Setting the MTU field, sets the maximum transmission rate, so that larger packets can be sent and received. You can set the MTU to a maximum of 1500 for Ethernet, 9000 for 1GbE, and 64,000 for 10GbE. The ports that you have selected must have the VLAN Segment IDs enabled. Click OK to create the VLAN Group. Configuring a VLAN Interface is an optional feature. If VLANs exist in your physical network, you must follow the steps in this section to use them in the cloud. VLAN (Virtual Area Network) is a mechanism to virtualize network interfaces across subnets and physical location so that they appear to be on a single confined LAN. This concept is used to isolate (and group) the network traffic across these distributed interface, which enables secure network traffic within such nodes. VLANs are divided into segments that are usually tagged with an ID. To manage network traffic tagged for different VLAN IDs, a separate VLAN or virtual interface can be created for each VLAN ID. When creating different logical networks in Oracle VM Manager, these VLAN interfaces can be attached to different networks to specify the type of traffic that belongs to a particular VLAN ID. If your network is configured to support VLANs, you should define interfaces for your different VLAN IDs on each of your servers, so that you are able to define Oracle VM networks that take advantage of VLAN separation. You can create multiple virtual LAN (VLANs) on the same NIC port. Each VLAN is an independent logical network operating with other VLANs over the same physical connection. Configuring VLANs involves creating one or more VLAN Interfaces, each of which contain multiple VLANs IDs. Click the VLAN Interfaces tab and click Create. Enter one or more VLAN Segments separated by commas. VLANs are divided into segments that are usually tagged with an ID. The ID is enabled on the switch ports connecting the virtual server to the switch. The valid range is from 2 to 4094. Click Add to select the ports to be added to the network. In the Create VLAN Interfaces: Add Ports page, click the Search icon next to the Select Virtual Server(s) field. Select one or more virtual servers to be added to the network and click Select. The list of ports with the MTU size, MAC Address, and status is displayed. Select the ports to be added and click Continue. If you select more than one port of a virtual server, they will be bonded. Network bonding refers to the combination of network interfaces on one host for redundancy or increased throughput. MTU: If your network supports jumbo frames, you must set the Maximum Transfer Unit size in the MTU field. Setting the MTU field, sets the maximum transmission rate, so that larger packets can be sent and received. You can set the MTU to a maximum of 1500 for Ethernet, 9000 for 1GbE, and 64,000 for 10GbE. Address Type: The network address assignment type can be Static, Dynamic, or None. IP Address: The IP address for the port. Netmask: The netmask for the port. Active-Backup: There is one NIC active while another NIC is asleep. If the active NIC goes down, another NIC becomes active. Load Balancing: The network traffic is equally balanced over the NICs of the machine and failover is also supported to provide redundancy. Link Aggregation: Aggregated NICs act as one NIC which results in a higher throughput, but also provides failover in the case that a NIC fails. The VLAN Segments with the ports, MTU, Address Type, IP Address, and NetMask are listed in the VLAN Interfaces region. These parameters can be modified if necessary. Click the Manage icon to add or delete VLAN Segments and click OK and return to the Create VLAN Interfaces page. Click OK to create the VLAN Interfaces and return to the Network page. Name: The name of the VLAN Interface that is created. Port: The network port on which the VLAN Interface has been assigned. Segment: The VLAN ID assigned to the VLAN Interface. Server: The server where the VLAN Interface is located. Network: The network to which the VLAN Interface is attached. MTU: The MTU value for the VLAN Interface. Address Type: The network address assignment type. This can be Static, Dynamic, or None. IP Address: The IP address allocated to the VLAN Interface. Netmask: The netmask applied to the VLAN Interface. Select the VLAN Interface you wish to edit from the list of VLAN Interfaces and click Edit. In the Edit VLAN Interface page, you can edit the MTU setting and the Address Type. If you select Static type, you can specify the IP Address and the Netmask. Click OK to save the changes and return to the previous page. Select the VLAN Interface you wish to delete from the list of VLAN Interfaces and click Delete. The Delete Confirmation dialog box is displayed. Click OK to delete the VLAN Interface. A network is a grouping of Oracle VM virtual server physical NIC ports. This section describes the procedure to create a logical network. If you choose to associate a network profile with the network, then the network profile must be created before the network is created. A network profile stores the network interface configuration (IP address, subnet mask, host name, DNS servers) that is allocated to network interfaces of newly provisioned virtual machines. Click the Create option in the Networks tab. You are prompted to configure the ports of the VLAN groups. Click Create VLAN Groups to configure VLAN Groups. For Oracle VM Manager 3.3, click Create VLAN Interfaces to configure the VLAN interfaces. 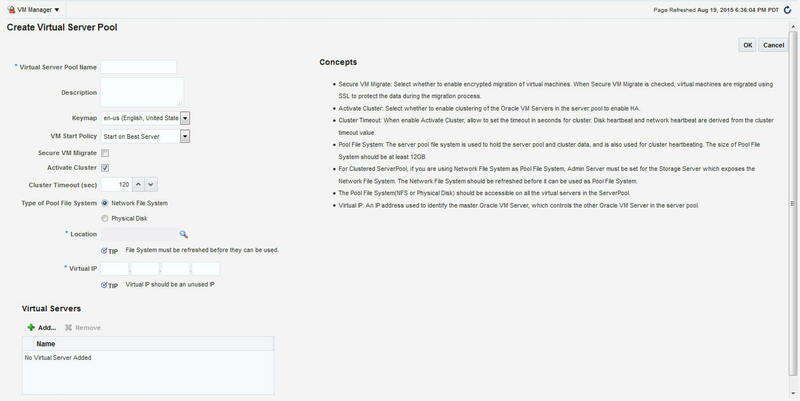 See Creating a VLAN Interface for Oracle VM Manager 3.3 for details. If you want to create the networks without configuring the VLAN groups or interfaces, click Continue Network Creation. In the Create Network: General page, enter the name and description of the network. Specify if you are creating an inter-server or intra-server network. An inter-server network is routable through standard switches. An intra-server network is available within a single server without a route to an external physical network. Specify the network role by checking one or more check boxes in the Network Roles section. To deploy a Guest VM, you must have at least one logical network with the Virtual Machine role. Server Management: Manages the physical virtual servers in a server pool, for example, to update the Oracle VM Agent on the different virtual servers. Live Migrate: Carries live migrate traffic. You can migrate virtual machines from one virtual server to another in a server pool, without changing the status of the virtual machine. Cluster Heartbeat: Carries cluster heartbeat traffic. Virtual Machine: Used for the network traffic between the different virtual machines in a server pool. The virtual machine role can either be an Inter-Server (routable through standard switches), or an Intra-Server (without a route to an external physical network). The Virtual Machine role must be unique on the network, which means that this network cannot have other network roles. It is however possible, and very likely, to have multiple networks with the Virtual Machine role in one Oracle VM Manager. Storage: Used for all storage transport in a server pool. It is used by the virtual servers to connect to ethernet-based storage repositories. Click Next. In the Configure Ports and VLAN Interfaces page, click Add and select a VLAN Interface from the list. Active Passive: There is one active NIC. If this one goes down, another NIC becomes active. Link Aggregation: All NICs act as one NIC which results in a higher throughput. Load Balanced: The network traffic is equally balanced over the NICs of the machine. Click Next. The Network Profile and QoS page appears. Defining the Network Profile and QoS is optional. A network profile stores the network interface configuration (IP address, subnet mask, host name, DNS servers) to be allocated to network interfaces of newly provisioned virtual machines. Network Type: You can select Internet Routable, Non Internet Routable, or a predefined set of network types. For more details, see Setting Up the Network Type. Network Profile: A network profile defines a set of IP Addresses, their associated host names (optionally), and common networking attributes for them. See Creating a Network Profile for details. Review the details entered so far and click Finish to create the network. A network profile is used to automate assignment of IP addresses to guest virtual machines. 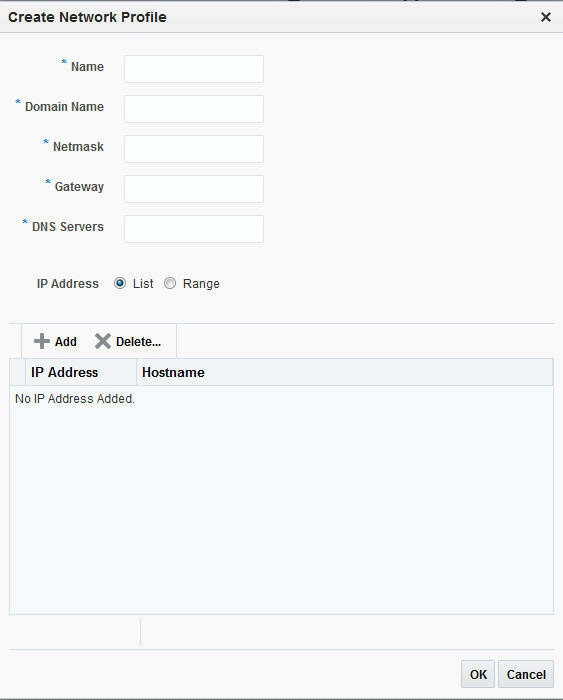 A network profile is a list of IP address along with host names. It defines a set of IP addresses, their associated host-names, and common networking attributes for them. From the Setup menu, select Provisioning and Patching, then select Network Profile. Click Create on the Network Profile page. Name: Unique name that identifies the network profile name. Domain Name: Domain for which the profile is being defined. The domain name must not begin with a dot ('.'). For example, you must specify the domain name as us.example.com and not with a dot ('.) in the front like .us.example.com. Gateway: Gateway for the IP address list. DNS Servers: Name resolution servers. List: Specify IP addresses with host name and MAC address (optional). Range: Specify a Hostname Pattern. The Start Value is appended to the host names generated. The First IP Address and the Last IP Address defines the range. For example: If the pattern is say hostprod and Start Value is 1, First IP Address is 10.1.1.1 and Last IP Address is 10.1.1.3, the host names will be hostprod1, hostprod2 and hostprod3. Click OK to save the network profile. You can create external storage elements like storage servers, file systems, and LUNs. An external storage element is created on dedicated storage hardware such as a server configured for NAS offering NFS shares. The server on which the storage element is present must be accessible by the Oracle VM Servers through a fibre channel or ethernet network. You can configure a virtual server pool with multiple such external storage devices. Right click on an OVM Manager target in the left panel and select Manage Storage. Figure 4-11 appears. A list of file servers, storage arrays, and local file servers that have been defined appears. iSCSI: An iSCSI target configured or discovered on the Oracle VM Server. SAN: A Fiber Channel SAN target configured/discovered on the Oracle VM Server. NFS: An NFS or NAS file system mounted locally. Select File Server (NFS) or Storage Array (iSCSI or SAN). You can register a File Server or a Storage Array by clicking the appropriate link. Select a storage element and click Discover to start the discovery operation of the file systems available on the server. A confirmation message prompting you to refresh the file system appears. Click OK to refresh the file system and return to the Storage page. Click on a File Server, Storage Array, or Local File Server link to drill down to the Details page. Select a storage element and click Validate. A confirmation message prompting you to validate the storage server appears. Click OK to refresh the file system and return to the Storage page. Click the File Server link on the Storage page. The Register File Server: General page appears. Name: Name by which the storage server is to be identified. Plugin Name: The Oracle VM Manager communicates with the external storage through a set of plug-ins. Generic plug-ins offer a limited set of standard storage operations on virtually all storage hardware, such as discovering and operating on existing storage resources. Vendor-specific plug-ins include a much larger set of operations (snapshot, clone, and so on). Admin Host: Host name of the Administration Server. Admin Username and Password: User name and password for the Administration Server. Access Host: Host name or IP address of the server offering external storage. Uniform Exports: Select this check box to indicate that the NFS exports are uniform. This ensures that all the VM Servers in the server pool will have access to the same exports on the NFS server. If this check box is not selected, the NFS exports can be accessed only by specific servers that are used to refresh the NFS file systems. Admin Servers: VM Servers that have the required Storage Plugin installed and are responsible for information exchange with the Admin Host of the Storage Server are referred to as Admin Servers. Click Add to add one or more Admin Servers. Refresh Servers: If you have not selected the Uniform Exports checkbox in the Register File Server: General page, click Add to specify the list of Refresh servers that will be used to refresh the NFS file systems. Click Finish to add the file server. The new server appears in the table. At this point, the Storage Connect plugin has established a link to the storage location. No storage has been mounted yet. Click Discover to start the discovery operation of the file systems available on the server. When the operation is complete, the available file systems appear in the File Systems tab in the Storage Details page. Click the Storage Array link on the Storage page. The Register Storage Array: General page appears. Fibre Channel Storage Array: A Fiber Channel SAN target configured or discovered on the Oracle VM Server. iSCSI Storage Array: An iSCSI target configured or discovered on the Oracle VM Server. Plugin Private Data: Any vendor-specific storage plug-in data that may be required. This is not available to generic storage. When registering a vendor-specific storage array, be sure to double-check the information you entered in the plug-in private data field. Once the storage array is registered, this field can no longer be modified. If you need to update the plug-in private data, you must unregister and re-register the storage array. Click Next. The Register Storage Array: Access Information page appears. Access Port: Port number used to access the storage. Access Username and Password: User name and password for the Access Host. Use Chap (Applies to all Access Hosts): Select this check box to enable Chap authentication. If you have selected the Storage Type as iSCSI Storage Array and Plugin Name as Oracle Generic SCSI Plugin (1.2.1 or above) in the Register Storage Array: General page, you can add multiple Access Hosts. Click Next. The Register Storage Array: Admin Servers page appears. Click Add to add one or more Administration Servers on which the storage plug-in has been installed. The Administration Server is responsible for information exchange with the Administration Host of the storage server. Click Finish to add the storage array. The new server appears in the table. At this point, the Storage Connect plugin has established a link to the storage location. No storage has been mounted yet. Click Discover to start the discovery operation of the file systems available on the server. When the operation is complete, the available file systems appear in the General tab of the Storage Details page. General: A list of Administration Servers is displayed. An Administration Server is a virtual server on which the storage plug-in has been installed. You can add an Administration Server or delete an existing one. In the Configuration region, the storage server details are displayed. Click Edit to modify details such as Name, Description, and the name of the Access Host which provides the external storage. In the Storage QOS Mapping region, map the storage type defined by the Cloud Administrator to the QOS defined by the Storage Server. Refresh Servers: For non-uniform NFS file system exports, you can specify the servers that need to be refreshed. Click Add. The Refresh Servers dialog box is displayed. Click Select Servers, choose one or more servers from the list and click Select. Click OK to refresh the servers. Select a file system from the list and click Edit. You can modify the name and description of the file system. Select a file system and click Delete. A confirmation message is displayed. Click OK to delete the file system. Select one or more file systems and click Refresh. A confirmation message is displayed. Click OK to refresh the file system. Access Groups: Shows the mapping between Refresh Servers and File Systems (Exports). You can Create, Edit, or Delete an Access Group. General: Provides general information on the storage array. A list of administration servers is displayed in the Administration region. An Administration Server is a virtual server on which the storage plug-in has been installed. You can add an Administration Server or delete an existing one. In the Configuration region, the storage server details are displayed. Click Edit to modify the Name and Description. Physical Disks: Displays a list of all the physical disks on the storage array. Depending on the type of storage connector (You can Create, Clone, Edit, Resize (resize or extend the physical disk), Rescan (refreshes the physical disk), Delete, and Create File System (create OCFS2 file system on the physical disk). The operation allowed depends on the type of storage connect plug-in that has been installed. For example, if the generic storage connect plug-in has been installed, you cannot perform a Create operation on the physical disks. Access Group: Shows the mapping between Storage Initiators and Physical Disks. You can Create, Edit, Present / Unpresent Access Group (Add or Delete physical disk), and Delete access group. Volume Group: Displays the volume group available for this storage server. General: The configuration details of the selected Local File Server including the Administration Host, Plug-in Name, and so on are displayed. File Systems: You can edit or refresh a file system in the list. Select a file system from the list and click Edit. You can modify the name and description of the file system. To refresh, select a file system from the list and click Refresh. Select the name of the virtual server and click OK to refresh the file system. A storage repository is virtual disk space on top of physical storage hardware, made available to the Oracle VM Servers in a server pool or various server pools. It defines where Oracle VM resources may reside. Resources include virtual machines, templates for virtual machine creation, virtual machine assemblies, ISO images, shared virtual disks, and so on. After you have created the storage server, you can assign these storage resources to the server pools in a zone by creating a storage repository. Right click on an OVM Manager target in the left panel and select Manage Storage Repository. The list of storage repositories that have been defined appears. Click Create to create a storage repository. In the pop-up window, enter the name of the storage repository. Click the Search icon in the Disk field to select the Storage Server and File System on which the storage repository is to be created and click OK. If you select the NFS File System, you must select the location of the storage server and a virtual server. You can optionally specify the Share Path and a description. The storage repository has now been created and will be displayed in the Storage Repositories page. Edit: Select a repository and click Edit. You can modify the name and description or release the ownership of the repository. Click OK to save the changes. If you are editing a storage repository that has been created on a physical disk, you can change the server pool with which the storage repository is associated. To change the server pool, in the Edit dialog box, click the Search icon next to the Server Pool field, select a different server pool and click OK.
Delete: Select a repository and click Delete. All the contents of the selected repository along with its associations will be deleted. Auto-Refresh: Select this option to enable Auto-Refresh and periodically refresh and update the file system size of all storage repositories. In the dialog box that appears, select the Enable check box and specify the Interval at which the file system size is to be refreshed. As the Auto-Refresh option locks the repositories, you must use this option when no deployment operations are scheduled. After you have created the storage repository, you can propagate it to one or more server pools. When the storage repository is prepared and created, it still must be made available for use by your virtual servers before it can be used. Typically you present the storage repository to all the virtual servers in the server pool. Right click on an OVM Manager target from the left panel and select Manage Storage Repository. In the Storage Repository page, click on a storage repository from the list. The list of server pools on which the storage repositories have been propagated appears. Select one or more server pools from the list and click Present. In the Present Servers dialog box, click the Select Servers icon. The list of members appears in the Select Targets dialog box. Expand the Members in this dialog box and check the boxes for zones, pools, or individual virtual servers and click Select to return to the previous dialog box. Click Present to mount the member on the server. Click on a Repository Name link. The Storage Repository Details page shows the list of server pools on which the selected storage repository has been propagated. Click the Assemblies tab. An assembly can be imported as a single .ova file. Software Library: The list of assemblies present in the Software Library are displayed. Select the assemblies to be imported and click OK. After the assembly has been imported, a series of templates is created. This option unpacks the contents of the assembly, for example, configuration files, disk images, and so on. External: Specify a external URL from which the assembly is to be imported and click OK. The URL you specify must be accessible from the OVS Host on which the repository is presented. Click on the ISOs tab to import the ISO images. Virtual machines have no access to the physical DVD or CD-ROM drive. You can assign virtual drives to virtual machines by offering .iso files containing the image of a DVD or CD-ROM. These image files can be found in the ISOs tab of the storage repository. Software Library: The list of ISO images present in the Software Library are displayed. Select the ISO images to be imported and click OK. Select the ISO image that has been imported and click Assign to assign this template to a server pool. External: Specify a valid external URL from which the ISO image is to be imported and click OK. The URL you specify must be accessible from the OVS Host on which the repository is presented. Creation Time is not displayed if you are using 3.4 or later versions of Oracle VM Manager. Click the VM Templates tab. Templates contain the configuration of a single virtual machine. When you create a new virtual machine, you choose to either create it from scratch or from a template. In a storage repository, templates are typically imported as an archive (.tgz, .tar or other). The archive contains a .cfg file with the virtual machine configuration, and at least one .img file which is a virtual disk image. Software Library: The list of VM Templates present in the Software Library are displayed. Select the VM Template to be imported and click OK. After the template has been imported, select the template and click Assign to assign this template to a server pool. External: Specify a valid external URL from which the VM template is to be imported and click OK. The URL you specify must be accessible from the OVS Host on which the repository is presented. Click on the Virtual Disks tab. Click Create and size of virtual disk to be created. Indicate if this is a shared disk by checking the Shared check box. Software Library: The list of virtual disks present in the Software Library are displayed. Select the virtual disks to be imported and click OK. Select the virtual disk has been imported, click Assign to assign this template to a server pool. External: Specify a valid external URL from which the virtual disk is to be imported and click OK. The URL you specify must be accessible from the OVS Host on which the repository is presented. If you reference the virtual disk using http:// or ftp:// protocols, you must include user/pw in the reference. For example, you must specify the URL as http://user:pw@host/virtualdisk_file_image_file or ftp://user:pw@host/virtual_disk_image_file. If the virtual disk is accessible by way of NFS, you can also specify file:///net/host/virtual_disk_image_file if the OVS is enabled for NFS automount. Click Return to return to the Storage Repository page. You can configure the virtual server to enable third party applications to back up the contents of the storage repository. The Repository Exports feature is available only for storage repositories based on physical disks and at least one server must have been presented to the repository. The virtual server must be configured to provide an NFS share to access the contents of the repository. The virtual server must be in a clustered server pool and have the OCFS2-based storage repository presented to it. Click the Repository Exports tab in the Storage Repository Details page. Click Create. The Create Repository Export window appears. Enter a name of the host which is used to mount the contents of the storage repository to the Export Server. Specify the options to restrict access to the respository. For Linux systems, the default is rw, async, no_root_squash. Click Add in the Export Server(s) region. Select one or more virtual servers on which the storage repository is to be presented and click Select. Click OK to submit the job and return to the Storage Repository Details page. Log in to Enterprise Manager as a user with the EM_CLOUD_ADMINISTRATOR role. From the Setup menu, select Extensibility and then select Self Update. The Self Update Console with the list of entity types that can be downloaded appears. Select the Oracle VM Templates and Oracle Virtual Assemblies folder and click Open. The Oracle VM Templates and Oracle Virtual Assemblies Updates page appears. Select an update and click Download. The Schedule Download dialog appears. Specify if the update is to be downloaded immediately or at a later date. Click Select. An Enterprise Manager job is created to download the update to the Software Library. Enterprise Manager starts downloading the archive from the Oracle Enterprise Manager store. Wait for the download to complete. (When in offline mode the system starts reading from the specified location.) When the download is complete, the status indicates that the update has been downloaded. Click Apply. A job is submitted to apply the update. The downloaded plug-in is applied and appears on the Oracle VM Templates and Oracle Virtual Assemblies Updates page. This section guides you through the ways of designing a server pool to meet your requirements. Before creating a server pool, you need to consider how many physical servers will be contained in the server pool, and what functions each physical server will perform. The more virtual machines you will run in the server pool, the more resources these virtual machines will consume, therefore the more physical servers are needed to provide sufficient resources for the server pool.A server pool is scalable. If you find a server pool does not have sufficient resources, such as CPU and memory, to run the virtual machines and the applications inside, you can expand the server pool by adding more Oracle virtual servers. A virtual server pool contains one or more virtual servers and guest virtual machines. A virtual server can belong to one and only one virtual server pool at a time. Guest virtual machines and resources are also associated with the server pools. A non-clustered virtual server pool can contain a maximum of 64 Oracle VM servers and a clustered virtual server pool can contain a maximum of 32 Oracle VM servers. Virtual servers that can be deployed as the Master Server, the Utility Server, and/or the Guest Virtual Machine. At least one virtual server is required in a server pool. All virtual servers in a server pool should have CPUs in the same CPU family. If they are not in the same CPU family, some operations such as live migration may fail. Though the CPUs should be in the same CPU family, they may have differing configurations, such as different number of cores. Other hardware components on the host computer may also differ, such as the amount of RAM, the number and size of disk drives, and so on. Although the host computers may have differing configurations, Oracle recommends that all virtual servers in a server pool are identical. A dedicated file system (either a NAS export, or a LUN) to use as the server pool file system is available. IP addresses for the virtual servers must be available. The IP address to be used as the Master Server's virtual IP address must be an unused and available IP address. To create a virtual server pool, you must be logged in as an Administrator with Add Any Target privilege. To delete a virtual server pool, you must have Full privilege on the server pool and appropriate privileges on the virtual servers and guest virtual machines belonging to the virtual server pool. Right click on an OVM Manager target in the left panel and select Create Virtual Server Pool. Virtual Server Pool Name: The name of the server pool. A server pool name must consist of alphanumeric characters, and must not contain spaces or special characters, except the underscore (_) or hyphen (-) characters. The maximum length of a server pool name is 200 characters. Description: A description of the server pool. Keymap: Specify the keyboard type for the guest virtual machines created in this server pool. Start on Best Server: The best server in the server pool is used to start the virtual machine. Start on Current Server: The virtual machine will be started on the same server on which it was created. Secure VM Migrate: Specify whether encrypted migration of virtual machines is to be enabled. If this checkbox is selected, virtual machines are migrated using SSL to protect data during the migration process. Activate Cluster: Select this check box to enable high availability on the server pool. Cluster Timeout: If the Activate Cluster is enabled, you can set the cluster timeout period in seconds. The disk heartbeat and network heartbeat are derived from the cluster timeout value. Type of Pool File System: Select the pool file system to use for the server pool. The pool file system is used to hold the server pool, cluster data, and is also used for the cluster heartbeat. The type can either be Network File System or Physical Disk. If you are using a file server for the server pool, select Network File System. If you are using a physical disk on a storage array for the server pool, select the type as Physical Disk. Location: Click the Search icon to search for and select the pool file system. This must be accessible by all virtual servers in the server pool. Virtual IP: An IP address used to locate the Master Server in the server pool. If the Master Server changes to another Oracle VM Server, this IP address is then assigned to the new host. Click Add in the Virtual Servers section. Select one or more virtual servers from the Search window and click OK.
Before you add a virtual server to the server pool, it must have been discovered. See Discovering a Virtual Server for details. Click OK to create a virtual server pool. From the left panel, select the virtual server pool target that you want to edit. From the VM Server Pool menu, select Target Setup, then select Edit VM Server Pool. The Edit Virtual Server Pool page appears. Keymap: The keyboard type for the guest virtual machines created in this server pool. VM Start Policy: The policy to be used to start the virtual machines. You can choose to start on the current server or on the best server. Secure VM Migrate: Indicates whether encrypted migration of virtual machines is to be enabled. If this checkbox is selected, virtual machines are migrated using SSL to protect data during the migration process. Master Server: Indicates the server that is the master of the server pool. You can choose any server in the server pool to become a master. This feature is not available for Oracle VM Manager versions 3.4 and later. The Master Server feature is not supported in Oracle VM Managers versions 3.4 and higher. In the Virtual Servers region, you can add or remove virtual servers. Click Change Agent Password to change the password for the Management Agent running on the Master Server. The modified password will applied to the Management Agents running on all virtual servers in the server pool. You can Add, Edit, or Delete Anti-Affinity Groups. Anti-affinity groups specify that a group of virtual machines cannot run on the same server. In the Add Anti-Affinity Group window, enter a name for the group and select one or more virtual machines that should be part of this group. The virtual machines that are part of this group cannot run on the same server. Click OK to apply the changes to the virtual server pool. A zone is used to group related cloud resources together. Cloud zones can be created based on location, software lifecycle status, for grouping resources according to a cost center or for metering and chargeback purposes. Typically, a zone can cover a department or possibly a small data center. The cloud environment can comprise of one or more zones. Each zone has a set of metrics that show the aggregate utilization of the zone. To create a zone, you must be logged in as an Administrator with Add Any Target privilege. To remove a zone, you must have Operator / Full privilege on the zone. Right click the OVM Manager target for which the zone is to be created in the left panel and select Create Zone. In the Create Zone page, specify the zone name and description. Indicate if this zone will be used by the self service users by checking the Infrastructure Cloud Self Service Zone check box. Click Add in the Virtual Server Pool section to add one or more virtual server pools. See Creating a Virtual Server Pool for details. You can add the virtual server pools for which you have the privileges and that are not part of any other zone. Click OK. The virtual server pools and the storage arrays appears in the newly created zone on the Home page. Storage QoS refers to quality of service that is defined at the storage server level. Setting up the storage QoS involves defining various storage properties. Before deploying a guest virtual machine, you can define the storage QoS, map this QoS to a storage server, and specify this QoS while deploying a guest virtual machine. This involves defining the machine size, network type, and the storage QoS. After you have set up the storage QoS, you can set up the storage servers, network repositories, and storage arrays. This storage QoS can then be used during deployment of guest virtual machines. Right click on the Infrastructure Cloud menu in the left panel and select Setup. Click Create in the Storage Quality of Service page. In the pop-up window, specify the name and description of the storage QoS and click OK. The newly added storage QOS appears on the Storage Quality of Service page. Navigate to the OVM Manager Home page and select Storage from the OVM Manager menu. Click the Storage link under File Servers. In the General tab, scroll down to the Storage QOS Mapping region. Click Edit. The Storage QOS Mapping window appears. Click Add and select that you had created earlier. The Storage QOS you have added appears in the Storage QOS Mapping table. To see how this mapping is used when you deploy an assembly, navigate to the Home page of a Zone under the OVM Manager. From the Zone menu, select Deploy, then select Assembly. In the Deployment Configuration page, click Override in the Disk section and select the Storage QOS you have created. This storage QOS will be used for deploying the assembly. You can define the QoS for network by defining some network types like routable, internet-facing, and so on. After the network QoS has been defined, you can map this to any network that is being created. You can then use this network type while deploying a guest virtual machine. Select Setup from the Infrastructure Cloud menu. Click the Network Types link on the Infrastructure Cloud page. Click Create in the Network Types page. Enter a name and description of the network type and click OK.
Click the Machine Sizes link on the Infrastructure Cloud page. Enter the name (internal name of the machine size), description, number of VCPUs, amount of memory and local storage assigned to machines of this size. Click Save to add this machine size. Right click on the Infrastructure Cloud menu and select Setup. Click the Software Library User Configuration link on the Infrastructure Cloud page. Enter the password for the Cloud Software Library user who is allowed to import components from the Software Library. This password must be specified when the user accesses the Software Library and download the required components. The Software Library user must have Execute command privileges on the remote host. If Named Credentials are required to access the Management Agent on the remote host, the Software Library user must have View privileges while creating the Reference File locations for the Agent Storage Type. From the Setup menu, select Security, then select Named Credentials. Select the Named Credentials to be used while creating the Software Library Reference Location of Storage Type: Agent. Click Add Grant. Select the CLOUD_SWLIB_USER and click Save. Select the CLOUD_SWLIB_USER and click Edit. Navigate to the Target Privileges step. In the Target Privileges section, click Add and select the host target on which the Management Agent is running. The host target is added to the table. Select the host target added in the Step 3 and click the Edit icon in the Manage Privilege Grants column. Select Execute Command in addition to the already existing View option and click Continue. Click the Request Archiving Policy link on the Infrastructure Cloud page. Select the Enable Archiving check box, specify the Archiving Duration, and click Apply. The requests will be archived for the specified period and will then be purged. You can configure the YUM repository that is to be used to upgrade the virtual server. The configured YUM repository can be used for to upgrade all discovered virtual servers. The YUM repository being configured must be present at a http location. You can configure an internal or public YUM repository. Right click on an OVM Manager target in the left panel, then select Manage YUM Repository. Name: Name of the YUM repository. YUM Base URL: HURL for the YUM repository. Enable GPG Key: Select this check box if you want to enable the GPG key. The GPG key checks the validity of the YUM repository and packages downloaded from the repository. YUM GPG Key: If the Enable GPG Key field has been checked, specify the YUM GPG Key here. Click OK. The YUM repository will be configured for the Oracle VM Manager. Right click on a VM Server in the left panel and select Upgrade. The Upgrade button is disabled if the Oracle VM Manager version is 3.3.x and the Oracle Virtual Server version is less than 3.3.1. A confirmation message appears. Click OK to proceed with the upgrade. After the virtual server has been upgraded, the virtual server will be restarted. Click on a VM Server in the left panel to navigate to the VM Server Home page. From the VM Server menu, select OVM Events. The list of unacknowledged events appears. Select an event from the list and click Acknowledge to acknowledge the event. This feature is available only with Oracle VM Manager 3.2.1 or later. The NTP Server to be added must already be configured to provide the NTP service. From the Enterprise menu, select Cloud, then select Oracle VM Infrastructure Home. The Infrastructure Cloud Home page appears. Right click on an Oracle VM Manager target from the left panel and select Manage NTP Configuration. To add an NTP server, click Add. In the Add NTP Server dialog box, enter the IP address or hostname of the NTP server in the IP Address/DNS Hostname field and click OK.
To edit an NTP server, select the server in the table and click Edit. In the Edit NTP Server dialog box, you are prompted for the name of the New NTP Server. Enter the IP address or hostname of the new NTP Server and click OK.
To delete an NTP server, select the server in the table and click Delete. A confirmation message is displayed. Click OK to delete the server or Cancel to cancel the operation. To update the NTP server configuration on all Oracle VM Servers managed by the VM Manager, click Update All Servers. Any previous NTP configuration is overwritten. Alternatively, you can save the NTP server configuration that you have added by clicking Save. This option saves the configuration but does not update the Oracle VM Servers. You can push the configuration to the VM Servers at a later date. After any changes have been made the NTP server configuration, you must restart the VM Server for the changes to be effective. If multiple NTP configurations have been defined, the order in which have they have been defined will be used for clock synchronization. You can import a virtual machine into Oracle VM Manager from an external location. The imported virtual machine is placed under the VM Zone, VM Server Pool, or the VM Server you have selected. The virtual machine must be located on an FTP or web server, either as separate files, or compressed into a single archive file (for example, a .tgz or .zip file). Right click on a VM Zone, VM Server Pool, or a VM Server target from the left panel and select Import Virtual Machine. The Import Virtual Machine: Select Target and Source page appears. The destination target on which the virtual machine is to be imported and the name of the target is displayed. Source: Enter the URL of the archive (tgz or gzip) that is to be imported as a virtual machine. The URL can be in format HTTP, HTTPS, or FTP. Request Name: Enter a name for the virtual machine import request. Click Next. The Import Virtual Machine: Instance Details page appears. Enable High Availability: If you want to enable high availability for this guest virtual machine, select this checkbox. This option allows the guest virtual machine to be automatically restarted on other virtual servers in the pool in case the virtual server hosting the guest virtual machine fails. High availability must be enabled both on the virtual server pool and on the guest virtual machine. If it is not enabled on both, high availability is disabled. Start VM After Creation: Specify whether the guest virtual machine should be started automatically after it is created. CPU Scheduling Cap (%): Restricts the amount of physical CPU that a guest virtual machine can use. Use this to constrain guest virtual machine resource allocation. Keymap: The keyboard mapping that will be used by the guest virtual machine being cloned. Tags: Specify one or more tags for the virtual machine. These tags are used to logical group the virtual machines and can be used to search for one or more virtual machines that meet a certain criteria. VM Size: The amount of memory to be allocated to the guest virtual machine. The virtual server should have sufficient memory to run the guest virtual machine. Otherwise, the guest virtual machine will be created, but will not be started. The size of the guest virtual machine (memory and CPU values). Select the VM Size which can be Small, Medium, Large, or Custom. The Root Password, Network, and Storage configuration cannot be modified for an imported virtual machine. Click Next. In the Import Virtual machine: Schedule page, specify the Start and End Date. The Start Date is the date on which the request is being submitted and the End Date is the date on which the virtual machine is retired. Click Next. Review the details of the virtual machine being imported and click Submit. From the Enterprise menu, select Job, then select Activity to view the Job Activity page. This page shows the details of the submitted job. You can click on the Name link to view more details. From the Enterprise menu, select Cloud, then select Oracle VM Infrastructure Home. The Infrastructure Cloud Home page appears. Select an OVM Manager target from the left panel. From the VM Manager menu, select Administration, then select Storage Repository. A list of storage repositories that have been defined is displayed. Click on a storage repository name and click the Repository Events tab.